Sen. Bernie Sanders has a number of nemeses, whom he frequently accuses of squeezing the middle class: Walmart, Wall Street and the Koch brothers among them. Tuesday, flanked by 10 striking workers from Vermont and New Hampshire, he added FairPoint Communications to that list. Referencing the ongoing labor dispute between the company and its workers, Sanders told reporters, "What this conflict is about is the 10 multibillion-dollar Wall Street hedge-fund companies that own FairPoint and want to slash labor costs by more than $700 million." Roughly 1,700 workers in all three states, who belong to either the Communications Workers of America or the International Brotherhood of Electrical Workers, have been on strike since October 17. FairPoint has requested $700 million in concessions, which would entail freezing pensions, requiring workers to help pay for health care premiums and getting rid of health insurance plans for retired workers. The unions offered a counterproposal amounting to $200 million in concessions, which FairPoint declined. Workers have also criticized the company's use of contract workers. Vermont's Independent senator held a press conference Tuesday morning at his Church Street office to urge the communications company, which operates landline and internet services in Vermont, New Hampshire and Maine, to return to the bargaining table. And to make concessions when it does. 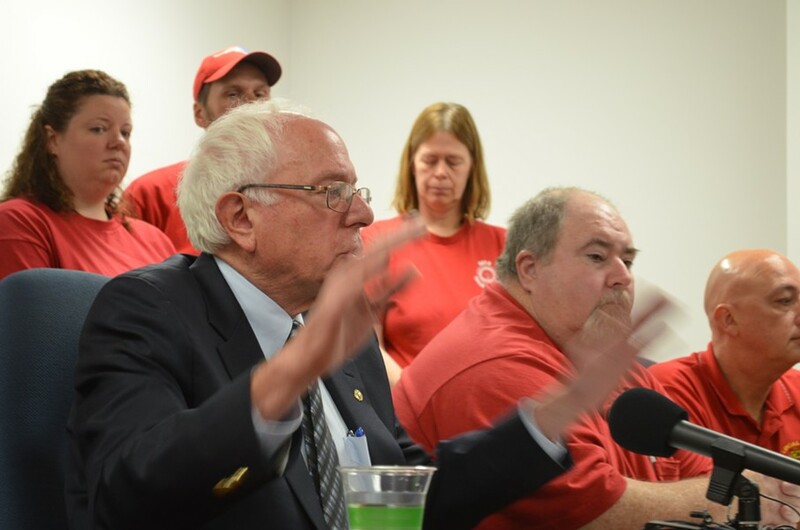 "FairPoint cannot have it all," Sanders said. "We are seeing attack after attack after attack against working families and the middle class, and that's exactly what we are seeing right here in this effort by FairPoint to cut back on what the workers at the company get from their hard work. What we are seeing here is exactly why the wealthiest people in this country and largest corporations are doing phenomenally well, while in Vermont, in New Hampshire and throughout this country, ordinary working people are working longer hours for lower wages." Mike O'Day, vice president of CWA District 6, described FairPoint as the Walmart of the telecommunications industry. "They just want to shake down hardworking people here in Vermont." Several hours before Sanders' press conference, FairPoint issued a press release calling attention to what it described as an unprecedented amount of vandalism to its infrastructure — eight incidents "in the nine days since the strike began," compared to one incident during the last five years, according to the company. Sanders dismissed the allegations as a public relations technique meant to distract.